Everyone receives the same items, and there is no profile to fill out. There are no spoilers and you have to subscribe the month before the next box is issued. For example if you order on 31 March you will receive the April box, and if you order on 1 April you will receive the May box. The rolling monthly subscription is easy to cancel, just do it before the next billing, which is the same date that you originally subscribed. For example if you start your subscription on the 15 March, your next billing date is 15 April, and if you wish to cancel do so on or before 14 April. International subscribers may get slightly different items if a nail polish or fragrance is included. An alternative is sent instead due to restrictions on posting certain items abroad. Boxes are non refundable, nor are the three or twelve month subscriptions. All the boxes are sent out at the same time, around the 10th of each month by Royal Mail (First Class). There are no discounts available for beauty boxes nor can loyalty points be accrued or used to buy beauty boxes. A monthly box costs £12.50, three months £37.50 and a year costs £150; theoretically there is no discount or incentive to subscribe for longer (perhaps to secure the price of the box?) except in the case of a gift or for international subscribers. I decided to wait a few days before writing the review to be more objective, and while the box is theoretically worth £40, you are paying about £2 per item, which is a better way of looking at it. It may seem like a bargain, but there is no point in boxes saying they were worth X amount and that you are saving Y amount when the products are of no use to you. Essentially I got a body wash, hand cream, face mask and a lip balm, but I can understand why they include generic items that everyone can use. However, I feel a lip balm as a full sized item is a bit of a stretch, and while useful to most people, sadly I don’t like pineapple or papaya, plus it’s their least best selling item according to the website. The Kimberley Sayer sachet is a little non-descript and has an expiry date of June 2017 (3 months), and on the card was a generic description of a sample. One can only assume the inclusion was to use up left over samples from a previous box offering. The Laidbare For Richer For Porer ‘Miracle’ Mask is currently on offer on the website for £2.50 and is for oily/combination skin, so isn’t suitable for me. Clay masks are great for oily skins or problem skins, but if you have dry or normal skin it could result in spots errupting. The PHB Ethical Beauty hand cream seemed like a safe item to put in the box and a good introduction to the brand, however the essential oils are over powering and the cream wasn’t rich and leaves a tacky residue. If anything, it has put me off using any other item from the brand. The last item, the Seascape Island Apothecary Unwind Body Wash is lovely to use and is made with 100% Jersey lavender. It’s also concentrated and lathers quickly and the scent is subtle. As much as I like it, I’m not sure I would spend £16 on a body wash, but they would make wonderful gifts to give and to receive. Initially I was going to give a score of 2.5/5, but reconsidered the fact that the signing up and delivery were spot on; the signing up was straight forward with no small print, and the delivery was quick. The subscription is easy to cancel too, and there are no notice periods to give with the monthly subscription. The contents were a little hit and miss, but the idea is to introduce people to the brands and not necessarily the items themselves. I felt a little short changed as one item was on offer, a sample sachet had nearly expired, and the lip balm was the least popular item in the range. However, this is still good value as the items are full sized and is great for those who are looking for ethical or organic brands and to try them. As many items are generic they are easy to regift (and no sample not for resale on the back) and would be nice to give a box as a gift. 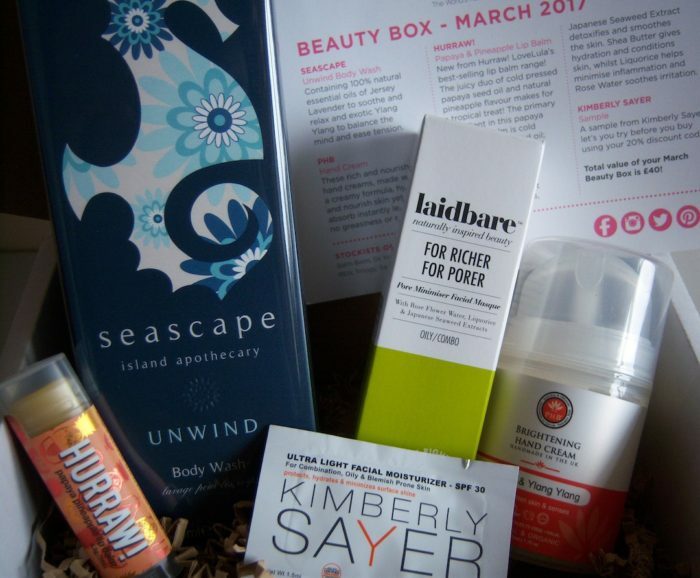 I would recommend the box, despite the fact I will only use one item, but that’s the gamble you take with a beauty box. Sign up for a box here.